It's always great when a big company innovates, but just like a little knowledge is a dangerous thing, a little innovation can be that way for creating a million paper cuts of user pain. 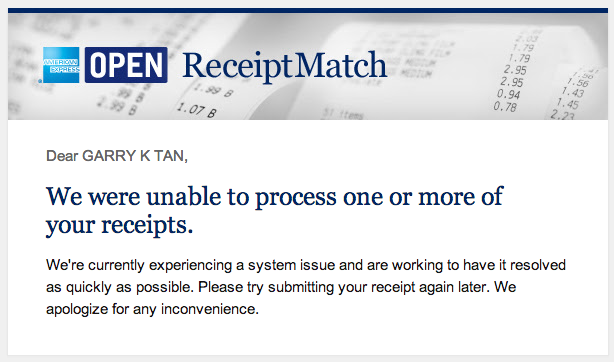 Here's one paper cut by American Express's ReceiptMatch service, that can take posts by email. But unfortunately, when its servers are down (and they are down often), the service just starts instantly rejecting email. This simply isn't the kind of thing a normal software engineer would do. Emails queue by default, actually — and receipts are rarely so mission critical that I need 200 millisecond response times on my receipt emails. So just leave the email in the queue and process it when you can. A rare case of addition by subtraction — it's actually more work to send a rejection email than it is to let it sit in an email queue. That's the easiest thing in the world to do, and infinitely better than what they do now.